Note: This is Part Six in a series, “God’s Emotions: Why the Biblical God is so Very Human.” Parts 1-5 are available at www.awaypoint.wordpress.com. Do people think I am crabby? Or insecure? Or jealous? Do they think I am easily pleased? Happy? Contented? One way to tell would be to ask them. Another would be to watch how they interact with me. Christians spend a lot of time interacting with God, or at least attempting to. We may not be able to tell what is happening on God’s side of the conversation (that is highly contested), but we know a good deal about the human half. How humans attempt to approach, influence or simply relate to God tells us about how they perceive him. The writers of the Bible provide pages and pages of advice on how to relate to God. Consequently, we have information about how they perceived him too. According to cognitive scientist, Pascal Boyer, most supernatural beings regardless of their physical form, have human psyches, including emotions. The God of the Bible is no exception. I have said that biblical ideas about God’s anger may come from how humans expect powerful people to behave toward those of lower status. In actual fact, sermons and sacred texts that wax eloquent about God’s anger are just one of many clues that most of the Bible writers related to God as a high status human. Most Christians since do too. Gratitude (. . . for this unspeakable gift . . .). I would offer other examples, but the point I am making seems almost trivially true. What may not be so obvious is the hidden assumptions underneath this anthropomorphism. The “submission displays” described above are valued by powerful humans because our species developed under conditions of insufficiency—inadequate food supplies, not enough high quality mates for every man to have as many as he wants, limited fertile land, and so on. Dominance hierarchies appear in virtually all social animals that need to compete for resources, and submissive displays on the part of underlings allow this hierarchy to be established and maintained without physical violence. For example, weaker chickens duck and move away from food or off the most comfortable perch if their superiors in the pecking order arrive. In chimpanzees, a subordinate may crouch, hold out a hand, or squeak. Humans show submission through both words and behaviors, and these signals are so pervasive that actors are trained to incorporate hierarchy signals into every conversation. This is because acting and improvisation tend to fall flat unless social hierarchy is established among the characters. As social information specialists we depend on each other but we also compete with each other, and to minimize how much energy we spend competing, we establish hierarchies. Our desire to get as good a position as we can in the hierarchy makes us emotionally insecure. We are unsure of where we stand. Signals that other people will submit to us are reassuring. Pleasing. Most people find it uncomfortable to be told that Islam means submission. The images of forced submission can be a little too graphic. And yet the reality is that dominance and submission are an integral part of human relations, and of religions with person-gods. Even though humans are creative communicators, some of our religious behaviors may have specific biological roots. Consider for example the act of bowing one’s head in prayer. It probably is traceable to ancient postures that allowed commoners to approach royalty. The word grovel today means to show exaggerated deference or contrition in order to appease someone. But its medieval root appears related to the word prone and may have to do with the physical posture required to approach the king. A parallel word, “kowtow,” means to behave with extreme submissiveness to please an authority figure. But it derives from the traditional Chinese practice of bowing so low that your head touches the ground. But these behaviors in turn may derive from something far more ancient. In other primates, a bow communicates submission to an animal of higher status. It can be a means of avoiding a fight when tensions are high. In this world, if we understand our place, if we engage in submissive behaviors, then high status people let us hang around, and we ourselves gain status from the proximity. I recently was invited to an investment club meeting at the home of a powerful woman. Because I was working on this article, I couldn’t help but notice the actions of the guests (who were mostly less wealthy and less social). They expressed gratitude for the (exclusive) invitation. Praise for the catering was effusive; and for the garden. The words of the hostess got extra nodding. We all felt lucky to be a part of her circle. Christians gain status, at least in each others’ eyes and in their own minds, because of proximity to God. 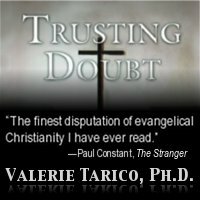 I am not suggesting that Christians are particularly arrogant, because I don’t believe that to be true. I think, simply that all of us are wired to orient ourselves according to hierarchical assumptions—they are inescapable—and to seek advantage within the hierarchy. I think also that these hierarchical relationships are mediated by emotions, and that we instinctively expect them in any being with a humanoid psyche. Since the Christian Bible describes a person-god who relates to humans, it is inevitable that believers respond to these contingencies. If the world were different, biblical Christianity might center on release from desire or ethical study or acts of compassion as in some forms of Buddhism. It might focus on ahimsa or nonviolence like Jainism. But that, I think, would take a different Bible. Like the God of Islam, the God of the Bible is interested primarily in worship. That is what the sacred texts tell us, and believers respond. As a consequence, intellectual assent, accompanied by submission behaviors and displays of devotion are core to both religions. The way that believers interact with God, both in the Bible and in modern life tells us who they think they are talking to. Unfortunately our god concepts fall victim to what we know about big cheese humans. This means that God not only has emotions, but a lot of them aren’t very nice. Gallery | This entry was posted in God's Emotions: Why The Biblical God is So Very Human and tagged affective science, anthropomorphism, Evangelicalism, psychology of belief. Bookmark the permalink. Fascinating topic. Does a deity have emotions? What emotions? Why would a god have these emotions (or why would humans invent a god with particular emotions)? I think a fundamental aspect to “breaking the spell of religion” will be making progress toward understanding where the idea of gods come from and what purposes they serve. In fact, I am working on a blog/book that focuses almost exclusively on how human social instincts likely play a role: “An Almighty Alpha: How Our Primate Heritage Contributes to Belief in Gods” (http://almightyalpha.com/) . I invite you to check it out.